It’s exactly one year ago that I started out from St. Jean pied de Port on the French side of the Pyrenees to walk to Santiago de Compostella. As regular readers of this blog will know, I never made it. This was, however, a day of triumph for me. I set out at seven o’clock in the morning into a rainy, dull morning and headed for the hills. 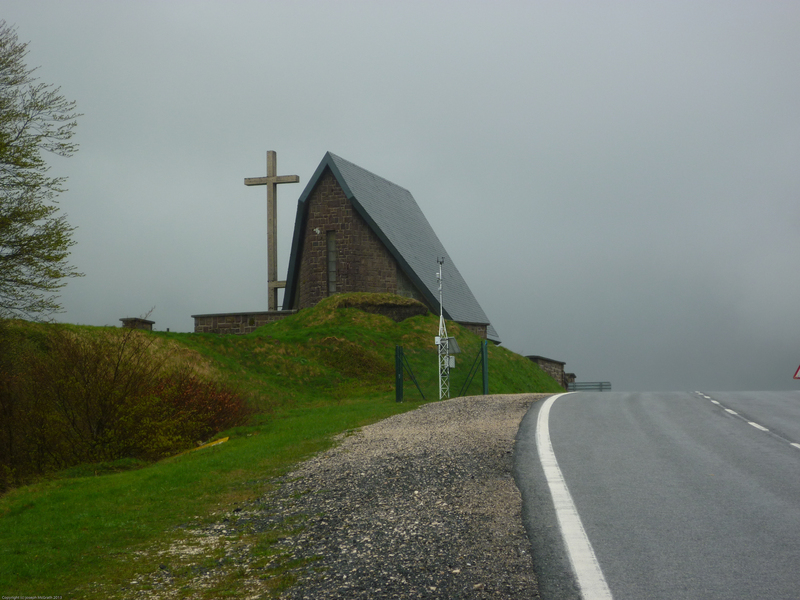 I was unsure about this stretch, I was trying to get over the mountains to Roncesvalles in Spain. I felt this was my last chance to do so. Certainly it was my last chance before reaching the age of 65 and becoming officially ‘OLD’. It is, at the time of writing, exactly one year ago that I walked across the Spanish border. By this time I had decided that taking the diversions suggested in the guidebook meant that I would be climbing up hills only to come back down again and that was a waste of the little stamina that I posessed. I decided to stick to the road. The Route Napoleon over the top had been closed the day before because of snow. The top was still enveloped in cloud and there was no chance of capturing the magnificent views from there, so I opted out of that route. I later found that I had made the right decision as the route was not fully open and several Pelegrinos had come a cropper on icy slopes. After a short stop to eat some bread and drink some water I set off on the increasingly steep road. I was beginning to struggle under the weight of my haversack and was met with disappointment at each bend in the road to find, not the summit but another winding stretch. I don’t have the literary skills to describe the elation when the church at the top loomed out of the mist and I realised that the top was within my reach. I reached the hostel, exhausted, but with a real feeling of achievement. I had successfully completed the first and most difficult stretch of my journey and I felt that I would easily finish the pilgrimage and reach Santiago de Compostella in triumph. Of course that was not to be. On the third day, the easiest walk in beautiful weather I had to drop out with pains in my chest. One year on, how do I feel about my walk? Well my chest pains amounted to nothing at all. I still get them but they seem to be a muscular problem. When I set out I was concerned about my right hip as it had been causing me some pain. It never bothered me at all on the Camino. Today I am popping pain killers to counter the the pain in my worn hip. I’m not so bad that I need a replacement – yet but I certainly could not attempt the walk from St Jean today. My feelings were correct. That was my last chance to have a go at the Camino. I didn’t complete it but I learned so much about myself and the nature of salvation that it was worth every heavy step. If you have thought of walking the Camino I would encourage you to have a go. If you would like to find out more about my short walk you can find a fuller account in my book “My Journey of Faith” availabe on Kindle. See my books page. I’ll continue to walk but on less adventurous routes.